Writer/director Steve Gordon concocted this affectionate throwback to screwball comedies of the 1930’s and included all of the trappings of the genre--witty dialogue, wealthy socialites, romantic hurdles, and vast quantities of liquor. Dudley Moore portrays the film’s title character, everyone’s favorite good-natured inebriate, Arthur Bach. Arthur is a giggling, drunken millionaire who simply wants to be loved. Unfortunately, his grasping relatives expect Arthur to expand their empire by marrying him off to the dull daughter of an equally rich businessman. Worst of all, the arranged bride intends to put an end to Arthur’s alky amusements. When instead Arthur falls for a working-class waitress (Liza Minnelli), he must choose between love and 750 million dollars. Arthur turned out to be one of the funniest films of the Eighties, and the sparkling writing brought out career topping work from Moore, Minnelli, and John Gielgud (as Arthur’s butler and father figure, Hobson). It’s a shame Steve Gordon died only a year after directing this tipsy tour de force, his first and only directorial effort. We could have used a few more classy cocktails like this one. Potent Quotables--ARTHUR: This is what I am. Everyone who drinks is not a poet. Some of us drink because we’re not poets. ARTHUR: It would have to be a real big woman. Video Availability--Unfortunately Arthur is only available in a full frame, pan and scan version on Region 1 DVD (Warner Brothers). This was an early DVD release that is in major need of an upgrade. 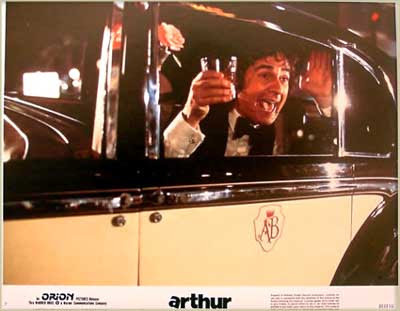 Similarly Sauced Cinema--Dudley, Liza, and even Sir John Gielgud returned for the 1988 sequel, Arthur 2: On the Rocks, but without Steve Gordon’s touch there was considerably less sparkle in the champagne. 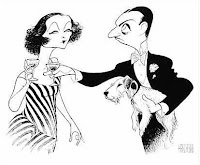 The Thirties saw hardboiled detectives and screwball socialites put away liquor with equal aplomb. So when the two genres were combined with 1934’s The Thin Man, it was a cocktail of explosive magnitude. 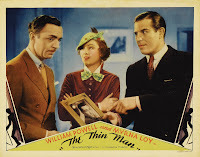 Incidentally, although the popularity of this screwball mystery led to five sequels with “The Thin Man” in the title, the “thin man” referred to in the original film is not Nick but one of the murder victims. Potent Quotables-- NORA: Say, how many drinks have you had? NICK: This will make six martinis. NORA: All right. (To waiter) Will you bring me five more martinis, Leo, and line them right up here? 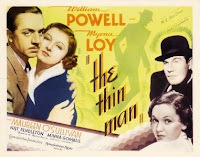 Video Availability--The Thin Man is available as a standalone DVD or as part of The Complete Thin Man Collection (The Thin Man / After the Thin Man / Another Thin Man / Shadow of the Thin Man / The Thin Man Goes Home / Song of the Thin Man). Similarly Sauced Cinema--After the Thin Man (1936), Another Thin Man (1939), Shadow of the Thin Man (1941), The Thin Man Goes Home (1944), and Song of the Thin Man (1947). 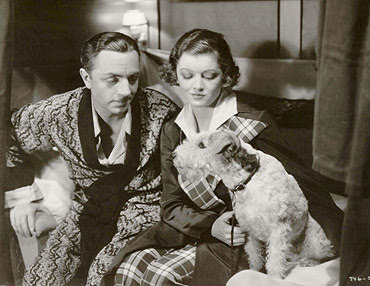 The second film is nearly as flammable as the first, but Nick and Nora curbed the cocktails dramatically in the later series entries. 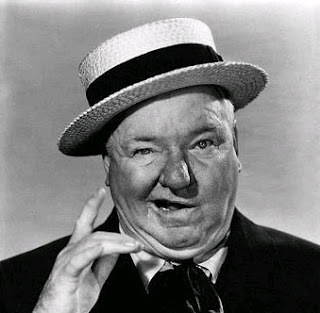 On January 19th, the Academy of Motion Picture Arts and Sciences will open an exhibition in their 4th Floor Gallery dedicated to the patron saint of booze movies, W.C. Fields. “The Amazing Peregrinations & Pettifoggery of One William Claude Dukenfield, late of Philadelphia, Pa., familiarly known to Crowned Heads and Hoi Polloi alike as W.C. Fields” will feature posters, photographs, publicity materials, letters, scripts, personal documents, artifacts, film clips, and sound recordings donated by family and friends of the Great Man. If you live in the Los Angeles area, don't miss this unique opportunity. Look for reviews of those films in March. In the meantime, I'll cover many other gems of soused cinema, including the films in Vol. 1. Bruce Robinson wrote and directed this semi-autobiographical (hopefully more “semi” than “autobiographical”) cult film about two unemployed actors living in squalor and desperation in London at the end of the swinging Sixties. The story is told from the point of view of Marwood (Paul McGann), the “I” of the title, who represents the more sensible end of the duo. That is, when he’s not suffering from chemical-induced paranoia. Marwood shares an apartment with Withnail (Richard E Grant), a self-absorbed, overly-dramatic coward, who is much more interested in obtaining his latest buzz than procuring employment (think “Daffy Duck” with a British accent loaded on red wine and whiskey). As the film begins, these lowlife thespians have reached a critical juncture. Their flat is cold and filthy; they suspect something may be living amongst the dirty dishes; and they are each near a state of nervous collapse. The situation is not helped by Withnail’s dire pronouncement--“I have some extremely distressing news,” he utters, draining a glass. “We’ve just run out of wine. What’re we going to do about it?” Since the prospects of their situation improving are not promising, the duo pay a visit to Withnail’s eccentric Uncle Monty, in order to hit up the rotund relative for a few stiff drinks and the use of his cottage for a restorative holiday. Unfortunately, Marwood and Withnail find that country life is no more restful than that in the city; and lacking food, firewood, and the necessary skills to survive off the land, starvation or hypothermia seem the likely outcomes. I must admit that upon first viewing the charm of this cult comedy completely eluded me. 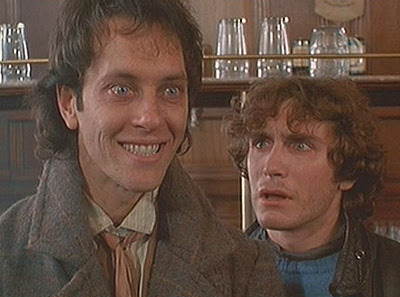 The characters of Marwood and Withnail are so completely helpless and self-centered that I initially found them both distasteful and unsympathetic. However, after multiple viewings, I have to conclude that I missed the boat on this one. 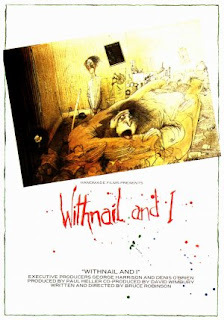 Withnail and I is a unique film that manages to wring dark comedy from an utterly sad slice of life. Robinson’s script is filled with witty, memorable dialog; and the performances of the three leads are brave and truthful. Above all, Richard E. Grant should be singled out for special attention. Much of the success of the film is due to his outlandish performance as Withnail. It is impossible to imagine any other actor in the role, and in his capable hands, Withnail comes across as selfish, cowardly, pretentious, sad, droll, and unstable, yet somehow lovable. Amazingly, not only had Grant never acted in a feature film before; he had never gotten drunk prior to accepting the role. Bruce Robinson was more concerned about Grant’s lack of experience in front of a bar than his inexperience in front of the camera, so he insisted that the teetotaler go on a bender to research the part. Apparently, it was worthwhile, because Grant’s Withnail is one of the most memorable boozehounds in the annals of soused cinema history. To sum it up, Withnail and I is subtle cocktail that tastes bitter at first but grows on you over time. It is an experience that should not be missed. Potent Quotables--WITHNAIL: We want the finest wines available to humanity. We want them here, and we want them now. Similarly Sauced Cinema--Bruce Robinson is set to write and direct The Rum Diary, the film adaptation of Hunter S. Thompson’s autobiographical novel, which will once again star Johnny Depp as Thompson’s alter ego. Charlie Chaplin, filmdom’s first megastar, owes his entrance into the movies to booze-spiked humor. 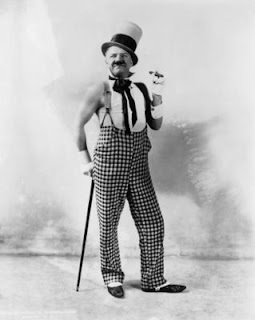 In 1913, Mack Sennett invited the then unknown British comedian to Keystone studios after seeing him perform his “drunk act” on an American stage tour. 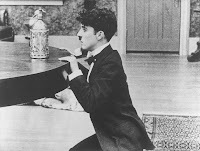 Chaplin soon became Sennett’s top box office draw, and he often mined his inebriated stage shtick in his earliest short subjects. But Chaplin’s greatest recreation of his drunk act came three years after his film debut with the amazing 25-minute short subject, One A.M. The short consists of a rich rummy’s attempts to get upstairs to his bed after a night on the town. 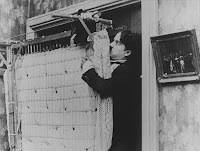 Chaplin takes this simple premise and turns it into a one-man tour de force, as every prop (a goldfish bowl, throw rugs, dual staircases, taxidermic animals, a clock, and a coat rack) becomes a malevolent obstacle standing between him and his goal. This culminates in the film’s highlight, Chaplin’s epic battle with a Murphy bed that refuses to stay on the floor. 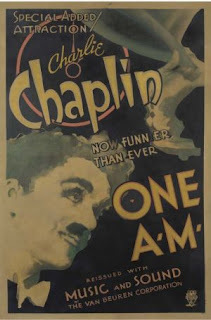 Not only was this short experimental at the time--apart from a brief appearance of Albert Austin as the cab driver delivering Charlie home, Chaplin performs the short solo--it also set the bar for staggering slapstick. Potent Quotables--TITLE CARD: That’s the fastest round of drinks I ever saw! Video Availability--The Mutual shorts have received numerous releases, but the set to pick up is The Chaplin Mutual Comedies: 90th Anniversary Edition (Image). This release restores over five minutes of newly discovered footage to One A.M. Previous video versions run only 20 minutes long. 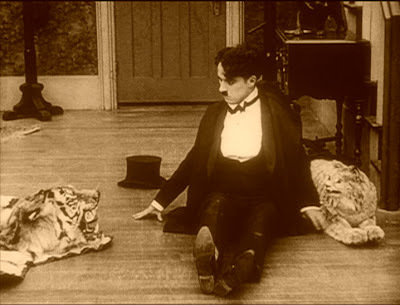 Similarly Sauced Cinema--Chaplin’s shorts His Favorite Pastime (1914), The Rounders (1914), A Night Out (1915), A Night in the Show (1915) and The Cure (1917), as well as his feature-length masterpiece, City Lights (1931), are must see comedies with loads of loaded laughs. If you’re familiar with Modern Drunkard Magazine, you may have seen my article on “Soused Cinema,” featured in the January 2006 issue. Unfortunately, I was only able to skim the surface of the ocean of firewater-fueled films for that piece. 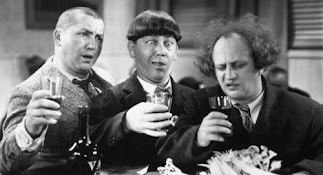 This blog will allow me to dive deeper into the rich cocktail of film history and shine a light on the role alcohol has played in motion pictures from the silent era to the present day. 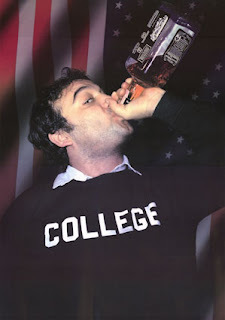 Predominately, this blog will consist of reviews of films in which liquor has played a major part. Each review will include a scorecard of drinks consumed, the resulting intoxicating effects, a booze-related quote, and other tipsy trivia. From time to time I’ll also provide news from the world of soused cinema, profiles of actors known for drunkenness onscreen or off, cocktail recipes transcribed from booze movies, and other related features. It is not required that you imbibe to enjoy these films. However, I would never dissuade a person from such an endeavor.